Shortly after coming to America, I went out for breakfast to some IHOP-like establishment. I clearly remember my shock: people put WHAT on french toast? Syrup?? Wild! 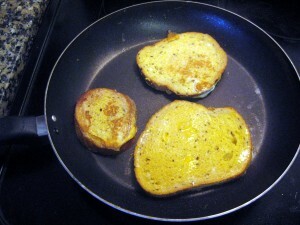 In this recipe I show how french toast – or “bread in egg” (chlieb vo vajci) – is prepared in Slovakia. We eat it salty. This dish is also good for disposing of those end pieces of bread that are too small to make a sandwich. 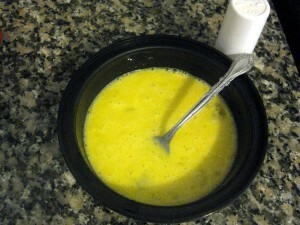 Whisk 3 eggs (vajcia), salt liberally, and coat bread (chlieb) in the egg. We often use heavy breads, such as rye. Piece of cake! Add more salt if needed. As a side note, those tomatoes came from my garden. Another great snack or possibly breakfast is potato pancakes. This is truly a piece of cake! I was using white bread, should checkout with rye bread. such a simply meal but soooooo delicious!! Finally, someone who understands french toast. The only sweet we would use (and only on occasion) was grape jam. I grew up thinking that salt was the only thing one would use with french toast. Ironically, grape jam was also used on potato pancakes, again occasionally. I’m Czech and Bohemian, so Slovak cooking is different. But I’m seeing how geography played an important role in our lives. These days, we think of French toast as just another way to have eggs in the morning. But to our ancestors, soaking bread in egg was a way to extend the life of a bread loaf longer. Try this sometimes. Take some old bread that is so hard you can no longer eat it but can still be sliced. Soak the slices in egg and fry them. The resulting bread will be soft and totally edible! i use babovka, or challah w/rasisins as it is called here in ohio, to make slovak french toaast. quite tasty! My dad would make me and my brother chlieb vo vajci every Sunday morning – my brother would eat it with Kraft single type of cheese and ketchup and I always powdered my with sugar and had a chocolate milk with it – yum! 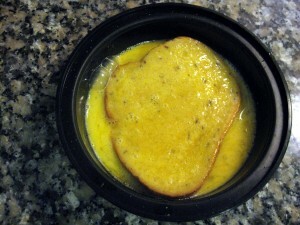 Actually we call it “pain perdu” (lost bread). It was initially made with old bread, as Lubos said. The harder the bread, the better! We first soak the bread in milk (with or without vanilla),and then in the eggs, put some sugar on it and fry the bread on a hot and buttered pan.